While line of sight determines obstructed and unobstructed on a line, a viewshed dictates surrounding areas as visible or non-visible from an observer POV. If I hide in this spot, what is visible from the observer’s point of view all around them (viewsheds)? Or if the observer looks in a straight line, what is obstructed or not (line of sight)? In a game of cat and mouse, viewsheds and line of sight would be your secret weapon of choice. This is why the military often use these tools with very accurate digital elevation models. The line of sight analysis uses a polyline as input. From an observer’s point of view, it determines where they have a clear view. The tool cuts the line up into obstructed and non-obstructed sections. Because line of sight determines what is visible and hidden along a line, the input is a polyline. Also, it’s important how you draw the line. For example, the order you draw vertices determines the start and end point of the visibility analysis. As shown below, the line of sight tool breaks the line up into obstructed and unobstructed sections. Line of sight showing visible (green) and non-visible (red) along line. From the start of the line to the end of line, you can begin to understand visibility. For example, visible is in green. However, non-visible is in red. So from the observer point, line of sight shows visibility along that path of vision. And it does this by dividing the line into obstructed and unobstructed pieces. On the other hand, a viewsheds analysis determines locations visible to an observer in all directions. In this type of analysis, it shows visible and non-visible in all of the surrounding areas. Instead of using a straight line as an input, viewshed analysis uses a single point. Likewise, we try to understand visibility from an observer’s point of view. But instead it’s a raster output indicating visibility. For example, you simply place an observer point on the map. In the result below, we see the viewshed in green from a point. 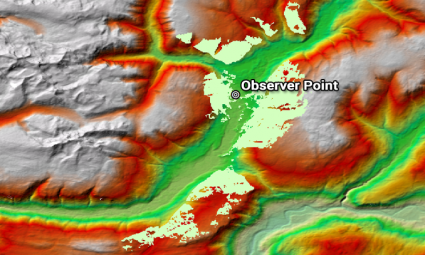 Viewshed analysis displaying visible areas from observer point. This extent is how far the observer can see, usually in raster format. In other words, if you look in 360 degrees, this is what is visible to the observer. 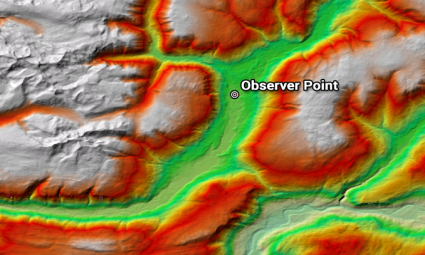 Although line of sight and viewshed are both visibility analysis, they produce different results. Whether it’s line of sight or a viewshed, both enable you to understand distance with sight. While line of sight carves out a straight line as obstructed and non-obstructed, viewshed dictates all visible areas from an observer’s point of view. Amongst other GIS applications, we often use visibility analysis in real estate, construction and military applications. Imagine using these types of analysis in a game of hide and seek. You’d be unstoppable. Where else do you see viewshed and line of sight in the world today? Map all day. Geoprocess all night. All with gvSIG software. gvSIG emerged in 2004. It’s been fine-tuned for over a decade and is used around the world.